On Sunday 1th November 2012, Pete and Clare attended the official opening of the brand new professional driving range at The Abbey Hotel Golf and Spa situated in Redditch. This fantastic development will be a great addition to hotel, offering state of the art facilities to all golfers with its two tier floodlit driving range. Raphael Design were commissioned by the hotel to supply a range of signage for the development and look forward to working with The Abbey Hotel on forthcoming campaigns to promote this new facility. 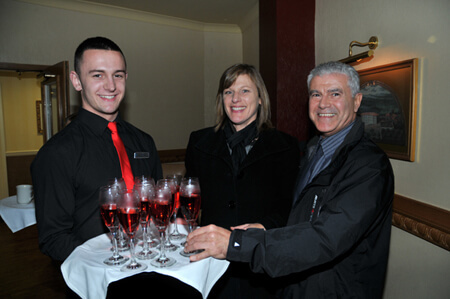 The Opening night was attended by over 100 guests. Former Ryder Cup player and six-time European Tour winner Paul Broadhurst performed the official opening ceremony. Guests were then entertained by top trick shot performer David Edwards who amazed us all using an array of unlikely props such as claw hammers, hosepipes and fishing rods, to perform breathtaking swings. Finally we were treated to some top golf tips from Paul Broadhurst.